I have received a few emails asking about any problems we have had with the Urban Arrow. Like all first generation items it has had a couple of issues. 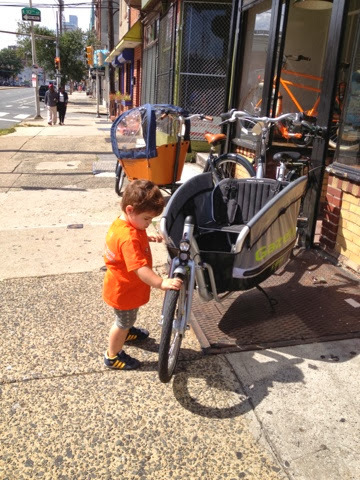 All of which have been addressed by the great customer service that both Urban Arrow & Rolling Orange have showed to us. Our first of two main issues was the battery display stopped reading properly and would constantly flash low battery. The battery itself has a button so you can see the actual percent left and I was getting full power so it was just a reader glitch. UA sent me a new one and the team at Rolling Orange installed it. The second was my crank arm/motor had shifted during transport overseas. It caused a knocking when you put pressure on the pedals. RO's owner took a crack at fixing it but it wasn't perfect so I took it over to the guys at Firth & Wilson. 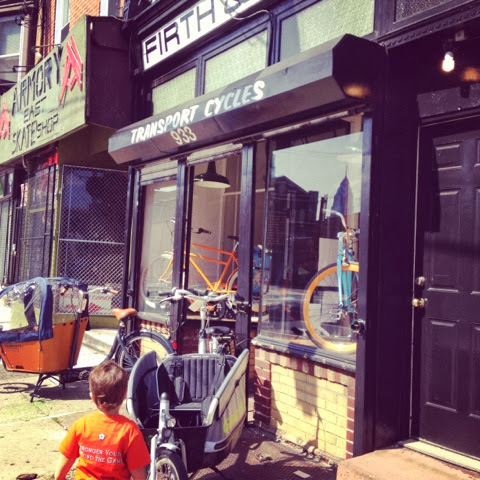 I cannot state enough how lucky we are that we now have a cargo bike shop in Philly. When we bought our bike this shop hadn't signed the lease yet so I had no clue who would take care of this large bike. I couldn't picture which shop in the city I could physically get the bike inside! But now we do! David Wilson took great care of my bike and was able to fix the crank issue but also took the time to look over my back brakes because he heard some noise (like my "technical" knowledge/terms there?!). Above and beyond what we needed done. In the end these minor problems are really not that big of deal and would have no way been deal breakers about buying the Urban Arrow. We really love this bike and the opportunity it allows our family. 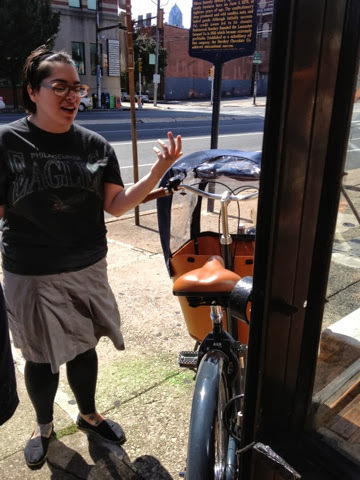 In other box and cargo bike news while at Firth&Wilson I tested out the Babboe City and Gazelle Cabby. 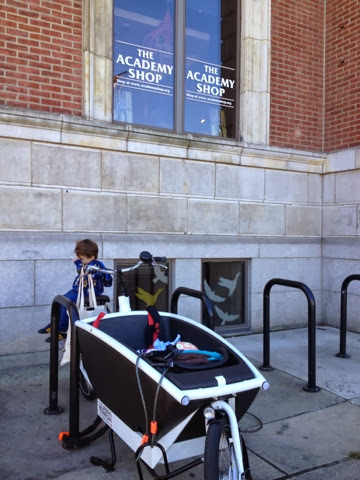 One of the other bike parents I know mentioned an interest in the Babboe but did not have a local dealer so I mentioned I could likely test it out at F&W. And that I did last week. I tried the new Cabby also because why not? M is just over 3 feet tall for size. In my unprofessional opinion Babboe City has a price tag of $2,500 so clearly not made of the most advanced components on the market. 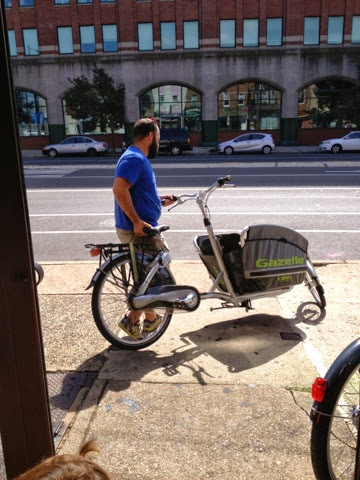 You'd likely want to upgrade some stuff (saddle was meh, and the tires could eventually be upgraded) but for the price it is a pretty nifty box bike. The shape of the box is really cool and from my research made from raw German Beech wood. The box appears small but the website claims with the babboe/ stecco baby mee you can fit a maxi-cosi and two kids. Likely how we place our oldest's feet on J's carseat you'd have to do the same. The gear shifting was easy enough for me and the hand brakes felt great. The front tire is visible unlike the Arrow's box so I now understood how people talk about seeing it and freaking out the first time they ride a long john bike. 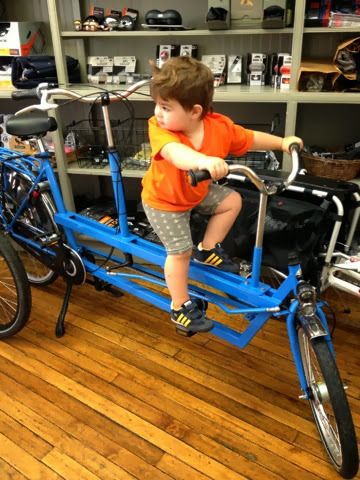 I would say this bike would be great for a two kid family in the flat parts of the city! Or maybe a two kid and dog household. Plus also there is a rain canopy for another $300 (which is the average price across all bikes it's seems). If you have really tall kids the canopy may be a squish. Oh hey it is me. With my eyes closed! Now onto the Gazelle Cabby. Priced at I believe $2,800 this bike is all kinds of design and function. The older model's foldable box was literally just not as pretty as the new one. The blue hues have been replaced by black and greens much more in line with Gazelle's Yepp coloring. For a foldable box it appears very sturdy and would be fine living outside. I personally prefer the wood or eps box since we have a carseat but the design of the Cabby's box still seemed very sturdy to my unprofessional eye. 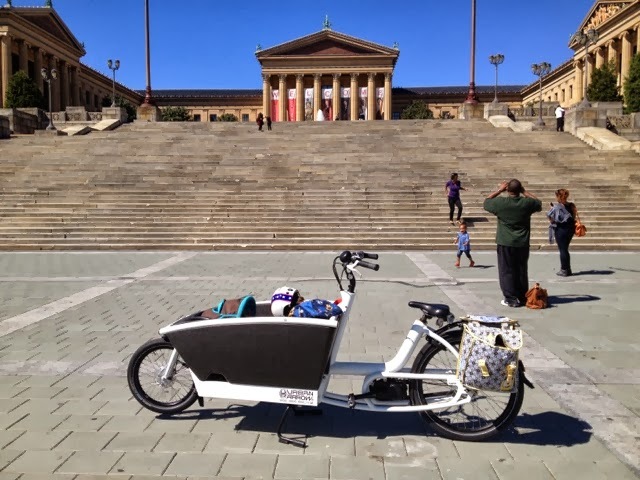 The bike itself felt light (I rode unloaded with no kids) and rode smooth. I found the gears easy to switch my husband didn't like them as much. 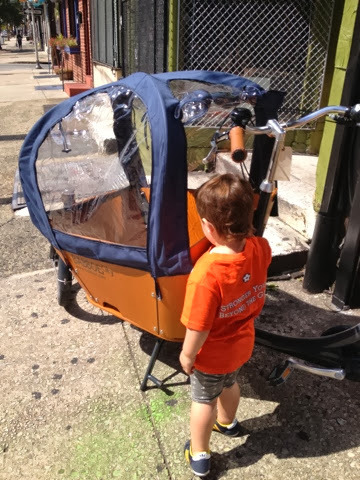 The Cabby can easily be connected with the Yepp seats to add more kid carrying space. Another great feature was the seat could quickly be adjusted between riders. The enclosed fender and sturdy back rack are nice too. Originally the Cabby was on our list of bikes but I was told it wasn't a great hill climber and you can't install e-assist. However on the (R)evolutions Facebook group a dad over in Europe did install assist and seems to carry a good amount of kids (5!!) and uses it on differing terrain. If we were rich and were going to buy a second box bike this would be on the top of my list. In other news the Onderwater Family Tandem is still on the top of M's list. Okay maybe mine too. Great read. Where can I find information about the (R)evolutions Facebook group? Thanks!